After having written quite a bit recently about Georgian wines that are not easy to get hold of in the UK, and sometimes frankly impossible, I thought I should investigate two that you can pick up in supermarkets. In fact, as far as I know these are the only Georgian wines you can buy UK supermarkets. And I was very impressed by them. As with any country really, there is a lot of low-end Georgian wine that I find unpalatable, but here the buyers seem to have done a pretty good job at finding decent quality at a sensible price. Let’s start with Tbilvino Qvevris 2015 12.0%, which was £10.00 from Marks & Spencer. Perhaps the first thing to point out is the remarkably low price. OK, there are no claims made about organic viticulture or low-intervention winemaking, and Tbilvino makes wine on an industrial scale. 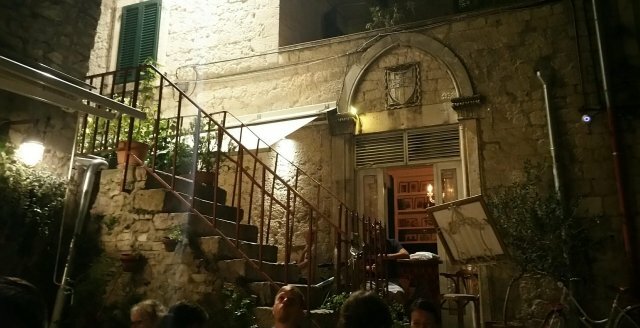 But even so, this particular wine was fermented in qvevri – large clay pots buried in the ground – and that itself is a relatively expensive small-scale batch process. The next cheapest qvevri wine in the UK is over £12.00, and most are closer to twenty. This is an orange wine, the colour being due to the must of white grapes being fermented on their skins. 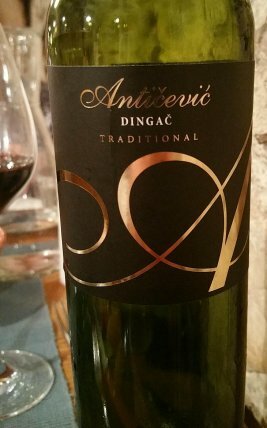 It was made in Kakheti (Eastern Georgia) where the tradition is to add stalks as well as skins, and to keep punching down and agitating the skins and stalks in the fermenting wine, all of which usually results in robust tannins. But this wine is altogether much more gentle, and while definitely having the character of an orange wine it is a lot more approachable than many, thus serving as a good introduction to the style. The grape is the Georgian variety Rkatsiteli, which is the most common white variety in Georgia, and highly regarded. The next wine, Orovela Saperavi 2008 13.0%, is available from Waitrose for £16.79. Orovela is a smaller producer than Tbilivino. They certainly used to make several different wines but now, according to their website and social media at least, seem to be focussing more on their Saperavi sales at Waitrose. Like Rkatsiteli, Saperavi is a common and highly regarded variety in Georgia. However it is a red grape, or to be more precise an extremely dark purple one, and also has red flesh, so it often gives very dark wines. No qvevris used here – it’s conventional winemaking with oak ageing. But the special thing about this wine as far as I am concerned is the considerable bottle age. In fact, at 10 years, I think it is the oldest Georgian wine I have ever tried. Georgian wines are often said to age well, but my impression is that in practice they are usually drunk young – by English standards at least. It’s a strange thing, expertise. In many areas, I think to call yourself an expert in a very broad subject would sound rather silly. I used to work in engineering research and I don’t recall anyone calling themselves an engineering expert, but there were certainly people regarded as experts in much narrower specialities. Until I came across wine experts I thought an expert is one who knows more and more about less and less. However, wine experts (and here I mean the ones the public see, rather than industry consultants and oenologists) often seem to have knowledge that spans across most of the vast subject of wine – vintage variations, grape varieties, where it’s grown, how it’s made, how to store and serve it, what to drink it with etc etc. Some may specialise to an extent, but even then the areas of speciality are usually quite large. Their depth of knowledge in wine varies tremendously from person to person, but what they have in common is the ability to communicate their wine knowledge – they are essentially critics, writers, broadcasters and teachers. So are these wine experts to be trusted, or should we listen more to the wisdom of crowds? That is the dichotomy often presented to us, but my answer is no in both cases. We should not trust wine experts per se, just because they are hailed as experts. And I am not even sure what the wisdom of crowds means in the context of wine – I can only imagine it would involve averaging the score of a lot of people you don’t know, who all work with their own rating system. Something which in my book is wrong at many levels. To me, the only sensible approach is to treat each expert individually, and to do exactly the same for anyone you might regard as a member of the crowd. Each will have a level of knowledge in the subject they are pronouncing on, each will have their own palate and preferences, and each will express their likes and dislikes differently. All those factors are important, whether they are making factual statements about wine or offering opinions. If you do not know the person well, what evidence do they give for any assertions they make? Do they simply assert, or do they refer to another authority, or science? If they talk only from their own experience, how reliable do you think that is? Remember it is very easy to extrapolate way too far from very limited data, and palates and opinions vary a lot. Personally, if I want factual information, Wikipedia is one of my first ports of call. In one sense it is a wisdom of crowds sort of work, but it is distinguished by the ethos of referencing sources. So if you doubt the article, or if it is important to you to get a particular detail right, you can check the source. Check if that detail is correctly derived from the source, and does the source in turn look reliable? Often it is not possible to do this with the pronouncements of wine experts, and even the best are fallible. For matters of taste, I trust my own palate mainly, not because it is particularly wonderful, but simply because it is mine. Beyond that, I am most influenced by friends. As we often share and discuss wines I think a lot of that influence is subliminal and ours view tend to merge, but I am also very aware where our tastes are different. So don’t trust experts just because they claim expertise, and don’t trust crowds just because they are crowds. First and foremost, consider the individuals offering the advice, and the evidence they have. It makes sense – trust me. Nero Oro, Appassimento, Nero d’Avola, Sicilia DOC, The Wine People, 2017, 14.0%. This is available from Majestic for around £9 if you “mix six”, otherwise £10. Oh, and it really is a Sicilia DOC wine as stated above, rather than the IGP designation shown in the image. The Wine People market it as part of their range, but the wine is actually made by Santa Tresa, an estate in South East Sicily near Vittoria. Appassimento means that before winemaking the grapes are partially dried, which concentrates their sugar, acidity and flavour. In this case the enhanced sugar content of the grapes ferments to give a wine with a highish alcohol content, and with some sugar left over after the fermentation to give a slightly sweet wine. Together with low astringency, this gives a smooth easy drinking wine with some classy fruit, and the wine’s sweetness is moderated by balancing acidity. This will doubtless have broad appeal, and it is well made for what it is, even if it is not a style I would usually drink myself. I suggest drinking it slightly chilled – maybe at around 17-18ºC. And remember it will warm up quickly if left out of the fridge in the hot weather we have been having recently, so probably best to bring it out a bit cooler than that. See here for advice on adjusting the temperature of wine bottles. I reckon it would work well with pork and duck, and pretty much any barbequed meat. Also with cheeses like Cheddar and Stilton, as a lighter alternative to Port. 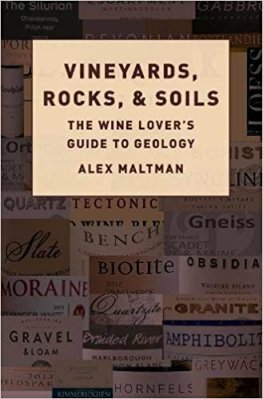 This is a review of Vineyards, Rocks, & Soils – The Wine Lover’s Guide to Geology, by Alex Maltman, a book published earlier this year, by Oxford University Press which probably explains the unnecessary comma in the title. I picked it up recently from Wordery for just over £20. The book starts at the atomic level, and works its way up in scale through two chapters about minerals (the chemical compounds that comprise rocks), then moves on to the three types of rock (sedimentary, igneous and metamorphic). That is followed by a couple of chapters about folds, faults and joints in rock, and how geology influences landscape. In this initial two-thirds or so of the book, there is little mention of how the geology influences wine, but the author does take pains to give examples of the minerals, rocks and landscape features under discussion in well-known wine regions and vineyards, and also notes how the geological terms are used on wine labels and in promoting the wines. Building on that basis, the rubber then makes firmer contact with the road as we learn about how this geology affects vines and wines. Largely it is indirectly through the soil, so we look at how soils are created, mineral nutrients, minerals in wine, and a more general look and the concept of terroir. This is followed by a chapter on geological time, and the names of the geological periods. This seems like an odd place to discuss geological time, and to an extent the author seems reluctant to discuss it at all, as he maintains the age of the rocks has no bearing on the soils, vines and wines. But it is nevertheless a favourite topic of wine-writers, and of people promoting wines and wine regions, so he thought it should be mentioned. Finally, the book ends with an epilogue discussion of the how the geology of the vineyard affects its wine’s taste. At the end of the book, I felt I had grasped the broad thrust of the main geological content, but I must admit I skipped through some of the detail, and very quickly forgot some detail I did concentrate on. But I still have the book, and with its excellent index, and use of a bold typeface to indicate where new concepts are explained, it will be good as a reference work to help keep myself geologically sound in my writing. Maltman seems to have become a bit of a bête noir amongst proponents of minerality and terroir, at least those who see things in black and white terms. But I think his attitude as expressed in this book strikes the right balance in a very measured and tolerant way. Nevertheless, and quite reasonably in my opinion, he does maintain a degree of scientific scepticism. I tend to agree with him on most of these issues of debate. Also, while pointing out that wine people often do not use geological terms correctly, I think he is also very understanding, admitting that the subject can be very confusing, and that even geologists change their minds and do not always agree amongst themselves. However, when he sees important geological errors in the wine world he is keen to flag them up. A good example is the common confusion between the very different rocks called tuff (volcanic) and tufa (precipitated from cold water). My final point is that Alex Maltman is an academic who has a wealth of experience in the teaching of geology, and it shows. He knows how to develop the subject in a logical way, how to explain topics that are likely to confuse, and how to lighten the mood with the odd anecdote. And he writes with authority. This is in marked contrast to the more journalistic style of writing where the author travels the world to “find out”, recording interviews with experts en route, and often requiring the reader to fill in the gaps and assemble everything to make a coherent whole. That journalistic style appears to be increasingly popular – but it is not for me. From listening to what other wine lovers say, and from personal experience, there really is something special about the country of Georgia and its wine. But I find it tricky to put my finger on exactly what that something is. Different people may have different ideas, but for me Georgia’s authenticity is very important – somehow the place is very real and true when compared with the artifice, spin and posturing in the world I am more used to. That and the hospitality of the Georgians, which goes along with their love of food and wine, and other ways of having a good time like singing and dancing. And it is also important to me that their love of wine is so closely integrated into their culture. Yeah, yeah, I hear you say, but isn’t that the case with many other wine countries and regions? Well yes, to an extent, but Georgia takes it to a whole new level. Georgia is not just a country of wine drinkers; it is a country of wine makers. It is estimated that the home-made product accounts for around two-thirds of all wine consumption in Georgia. And it is not regarded as inferior – quite the reverse in fact, as with products like home-made cake and jam in Britain. Of course, not all home-made wine is natural and made in qvevri, but that is certainly considered by many to be the ideal, and from what I have been able to establish a substantial proportion of it is made that way. 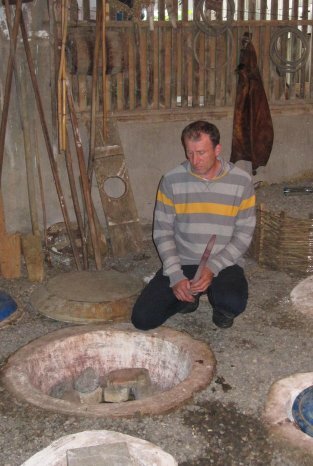 That base of home-made wine, together with very small-scale winemaking for local markets, forms the foundation for the commercial-end of artisanal qvevri wine production in Georgia. Bottling and labelling being the key additional process to enable it to be sold abroad, and alongside its peers in Tbilisi wine bars. This is the trendy stuff that gets most talked-about here, even if it represents only a few percent of commercial wine production in Georgia. To me, it is these cultural roots that make Georgian wines interesting and authentic – they are more than a mere fashion that could disappear as quickly as it arrives on the scene. 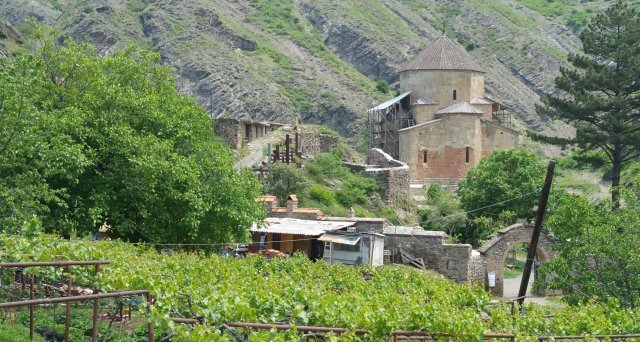 You may have heard stories about the Soviet Union wiping out traditional Georgian winemaking in Georgia for decades. Well, it didn’t disappear even then – it lived on in people’s homes and on farms, and is now flourishing again. I am not here saying that all natural qvevri wine production started as I described above; I know it didn’t. Equally, I am not saying that all such wine is superior. 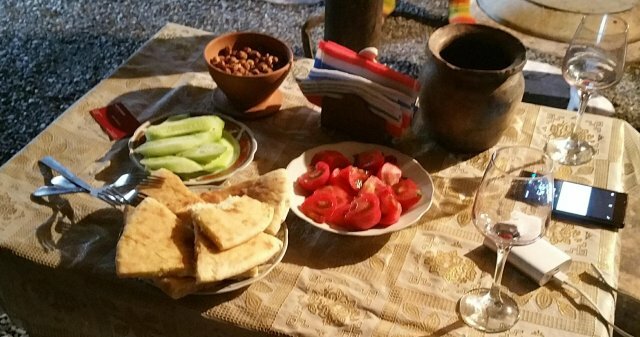 I am merely trying to explain what is special about it to me, and any hint of authenticity and rural tradition, however small, certainly adds to my enjoyment of Georgian wines. If that doesn’t impress you, fair enough, but please do not let it lead you to be dismissive about Georgian wines. You may find other things to like – the hundreds of native varieties for example, or the new generation of dynamic winemakers with innovative ideas. Or you might just like the way they taste, which I often do too! Beyond wine, it starts to get a lot more difficult for me to describe why Georgia is so special, mainly because I have thought about it less. Perhaps it lies in its people getting their priorities straight: relatives, friends, food and drink, more or less in that order. Oh, and patriotism, and God and the Church, are up there in the list too. A lot further down seems to be political correctness and health and safety, also materialism I think. I am not saying I agree with all those priorities, but somehow it is refreshing to see them so clearly visible anyway. Or at least they seem to be clear – maybe I am getting it all wrong, in which case I apologise. I would not be the first tourist to base my liking, or hatred, of another country on a misconception. Finally, Georgia makes me feel at home in a strange sort of way. Even if the people and countryside can be very different from their British counterparts, I feel a shared humanity, and even the soft greens of the landscape feel familiar. Somehow I belong. Nikoladzeebis Marani, which translates as Nikoladzes’ Wine Cellar, is the producer name you will see on wine bottles, but a lot of people will be more familiar with the name of the winemaker-owner Ramaz Nikoladze. 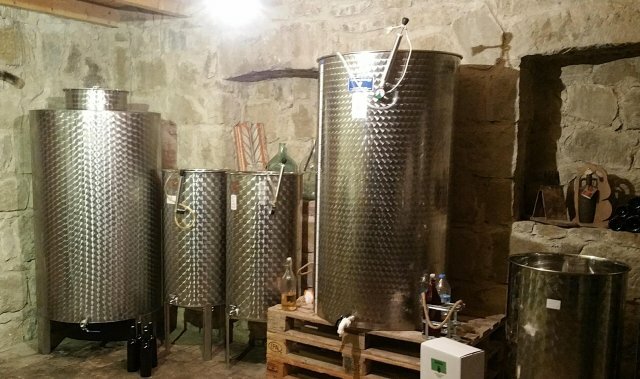 Like Archil Guniava and his family, who we had visited previously on of our tour, Ramaz is a man of Imereti, and was making and selling wine locally before it occurred to him to bottle it and sell further afield. But Ramaz went a bit further. He was a bit of ringleader in persuading his fellow Imereti winemakers to set their sights on Tbilisi and beyond, and was also one of the founding members of the co-operative that kicked off the Tbilisi wine bar Ghvino Underground, a place that gave these wines showcase and market. It was his wife, Nestan, who warmly welcomed us, showed us the new marani in an outhouse, and gave us lunch. We only got to see Ramaz briefly, as he was busy dealing with urgent business most of the day: he had to spray his vines, but there was a problem with the equipment. Archil had been spraying Bordeaux mixture, so presumably the same task was what Ramaz had in mind. The new marani was created a few years ago with new qvevri, as shown in the film Our Blood is Wine. Indeed, I included a still from the documentary in my review, showing Ramaz helping to roll one of the qvevri into place. But when we were visiting, the qvevri were full, sealed with glass discs and covered in sand, the smaller pots above ground being for temporary storage of wine. We were told that bottling would take place in a few weeks’ time. 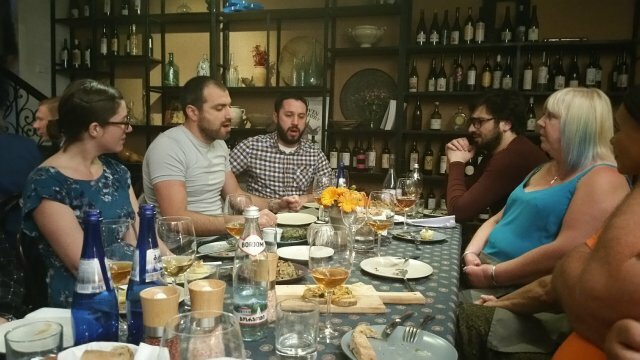 Then we were invited into the cool and spacious dining room of Nestan and Ramaz’s house, for lunch and the opportunity to try four different Nikoladzeebis Marani wines. I think all wines were from 2016, and below I have identified the wines by their varieties. More very brief notes I am afraid, but the wines I liked most are clearly indicated by my star ratings. 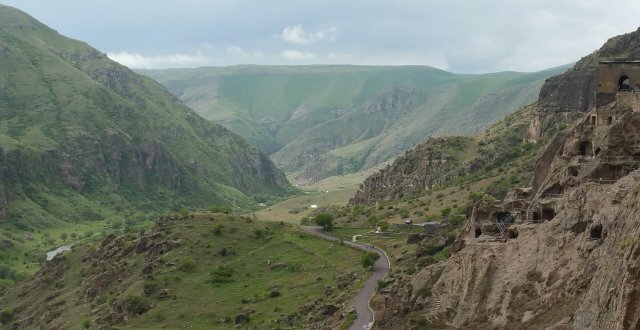 On our tour of South and West Georgia, returning to Tbilisi from Kutaisi we turned off the main road just after Gori, and headed South through the beautiful Ateni Valley for around 6 km. Just past the Sion Church, you will find a footpath on your left hand side. Take that path for a further kilometre or so, across the footbridge over the river, and you arrive at Nika Vacheishvili’s marani and guesthouse. As evidenced by the 4×4 parked there, you can drive right up to the house if you approach from another direction and know your way, but ours was the more obvious route. Here we see vineyards in front of the church, and behind that a hint of the landscape of the valley. We were welcomed by Nika (centre), and joined briefly by his wife Diana when eating lunch. Nika used to be the Georgian Minister for Culture, Heritage and Sport, and decided to create the wine cellar and guesthouse in this location while working on the restoration of the Sion Church. Wine production is small-scale, organic and natural, but it does not, as you may expect if you have been reading my blog, involve qvevri. Nika decided to start his winemaking in stainless steel, but has plans to use qvevri in the future. It would be interesting to see how the switch to qvevri will impact his wines. Unfortunately I cannot remember many details of the lunch, but it was all good. However, one thing I do remember as being particularly impressive was actually one of the more modest dishes: sliced beetroot. In England I am used to having this served in a little watered-down vinegar, but here the Georgian sour plum sauce (tkemali) took the vinegar role, and brought it to a whole new level. We had three wines served at lunch. Putting together my scrappy notes and information from the web, I believe we had the 2017 and 2016 vintages of the Atenuri – a wine from the Ateni Valley of 80% Chinuri and 20% Gorula Mtsvane. 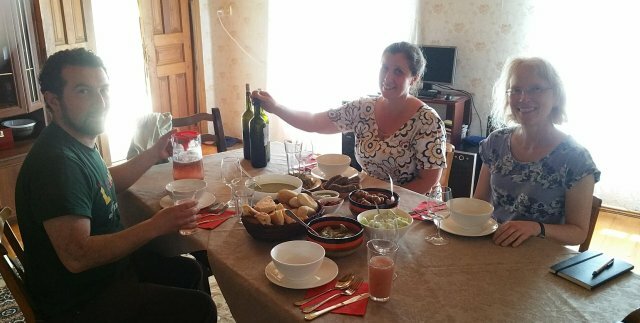 And the third wine was 2015 Koshkebis Chinebuli – made from 50 years old Chinuri vines – Koshkebis is Georgian for towers, and Chinebuli is a another name for Chinuri. To be honest, I am afraid to say I did not like these wines very much. I found the two Atenuri wines to be out of balance, in that they were too alcoholic for the body and aromatics. And the Koshkebis Chinebuli, although it had developed some interesting Riesling-like petrol notes, was a little musty. But I am a big believer in the subjectivity of wine appreciation, and my wife, whose opinions I respect, thought the wines were good. Maybe my palate was having an off-day. 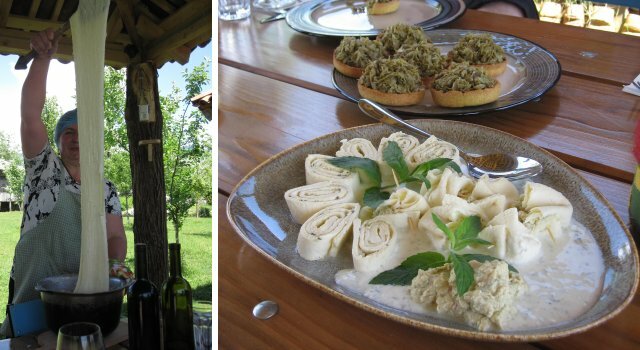 Regardless, if you are looking for good food, and a quiet place to relax for a few days in beautiful countryside, Nika’s guesthouse should fit the bill. As another stop on our tour of South and West Georgia, we visited Oda, the family home of Keto Ninidze. 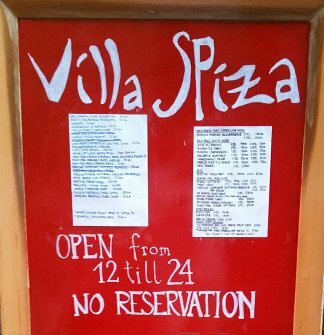 Beneath the living-quarters of the house is the family winery managed by Keto, and there is also a restaurant business there. The restaurant is where we had lunch, except we were the only guests at the time, and Keto stayed with us at the table after showing us around her cellar and vineyards. So where does Vino Martville come into the picture? Well, Keto is married to Zaza Gagua who is a partner in that winery. (It is sometimes styled as M’artville with the “art” bit in another font and/or colour, I shall stick with Martville!) Vino Martville is currently better established than Oda Family Winery, so you are more likely to have heard of it, and the wines drank with lunch were Vino Martville. 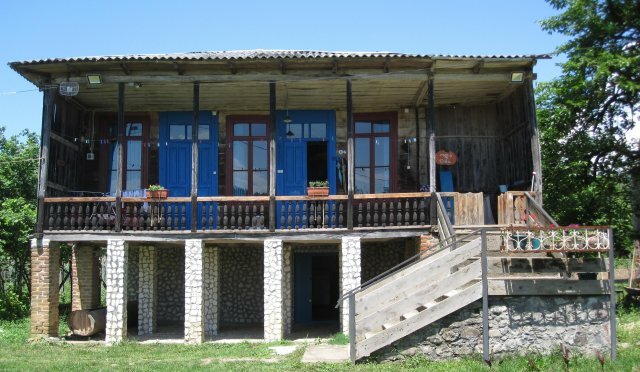 Oda Family Winery lies in the village of Martvili, in the region of Samegrelo. Not only is Oda the name of this house and winery, but the word also describes this style of traditional Megrelian house, with pillars to keep out the damp and a shady veranda. Zaza and Keto moved here from Tbilisi, but the house belonged to Zaza’s great-grandfather, who built it around 100 years ago. As is sometimes the case with oda houses, part of the ground floor has been walled-off to create a cellar space, and here the cellar contains qvevri and other winemaking equipment. I didn’t notice it when we were visiting, but that wooden thing to the left under the house, looks like a trough for treading grapes. Inside the cellar there is one small 50 li and few 500 li qvevri, along with a small basket press and stainless steel tank, and a storage room for bottled wine. Keto is shown here with one of her qvevri. Close to the house is a vineyard recently planted with the Ojalashi and Chviriluri varieties, but it is still too young to produce grapes for wine, so the first couple of vintages of Oda were made from grapes brought in. In front of the house across the grass is a separate building for the kitchen, which I think is a traditional arrangement in Samegrelo but this was over-sized to cater for the restaurant, and a wooden canopy to shelter the restaurant tables. 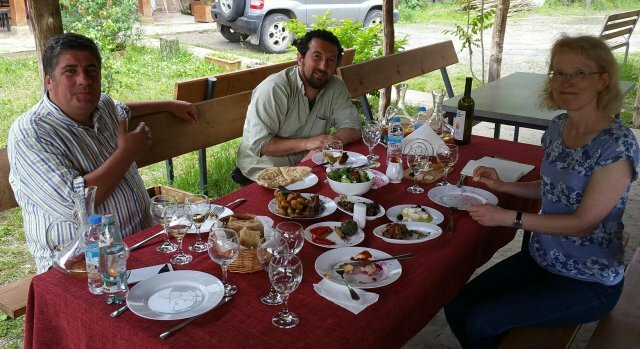 The food was amazing – quite possibly the best we have had in Georgia, though some of that enthusiasm may be due to my love of spice, which is one of the defining features of Megrelian food. We started with pickled jonjoli flowers in a corn bread tart-casing, which was a great combination. Also show below, looking like a tomato-free pizza, is Megrelian khachapuri. 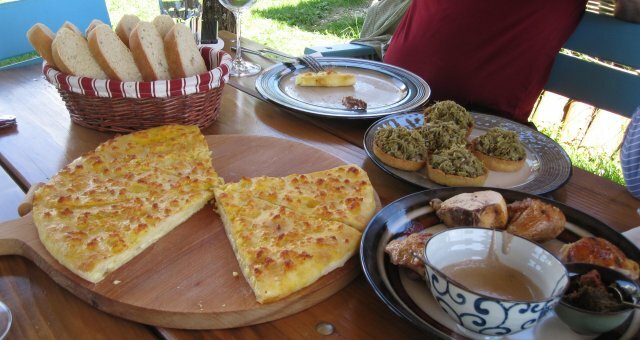 Unlike the perhaps more common Imeretian style of khachapuri, here the bread is not only filled with cheese but is also covered with toasted cheese. Mmmm, cheese – if I wanted to invest in a street food business in the UK, it would specialise in khachapuri. Also shown are pieces of chicken with a light brown walnut(?) sauce and, just visible bottom right, two types of adjika, which is a paste of chili and other spices. I believe the rolls shown below are gebjalia, which is also mainly cheese, the structural bit being heated cheese and milk rolled out when it has acquired the correct elastic texture, with a herby filling, and a soft cheese on the side and in the sauce. Cheese too is an important ingredient in the elarji, another Megrelian speciality, being pulled out of the pot to demonstrate that it has the right consistency. The basis is ghomi, which is a sort of porridge very similar to a soft polenta, and can be eaten as it is as the carbohydrate part of a meal. But if you stir in a type of cheese, and keep stirring and stir some more, you get a delicious cheesy stodge, which was served with an equally delicious and spicy stew. I think the meat was veal, and it was in a thick and slightly grainy sauce that I suspect got its consistency from nuts. Whatever it was it was good, and worked well with the elarji. Finally, a few words about Keto. 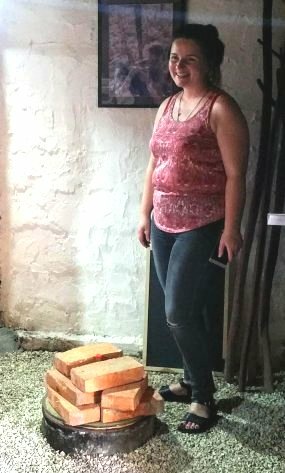 She was a philologist in Tbilisi and, in addition to making wine and looking after her family, intends to continue writing – about wine, and life at Oda. Judging by our conversations I am sure she will write from a thoughtful and interesting perspective, and I look forward to reading anything that might appear in English.